This Spacesaver slim line garden shed is very popular due to its narrow and long design. Fits under eaves and is large enough to store tools, sporting equipment etc. 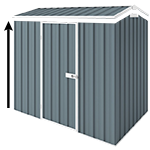 Ideal for storage in garages & carports in unit complexes as well as on small metro blocks.